This system is an active system with moving parts. 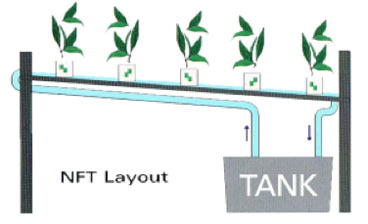 As active hydroponic systems go, water culture is the simplest. The roots of the plant are totally immersed in the water which contains the specific Growth Technology nutrient solutions. 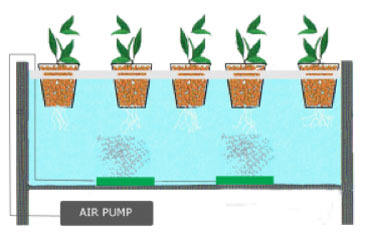 An air pump helps oxygenate the water and allow the roots to breathe. NOTE. Very few plants other than lettuce will do well in this type of system. 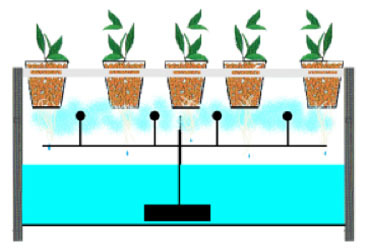 Dip systems are a widely used hydroponic method. 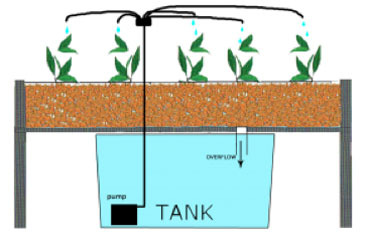 A timer will control a water pump, which pumps water and the Growth Technology nutrient solutions through a network of elevated water jets. A recovery system will collect excess nutrient solution back into the reservoir. A non-recovery drip system will avoid this allowing the pH of the reservoir not to vary. If using a recovery system, be sure to check the pH level of the reservoir regularly and adjust using either pH UP or pH Down solutions on a more frequent basis. The N.F.T system is at the forefront of people’s minds when hydroponics is mentioned. 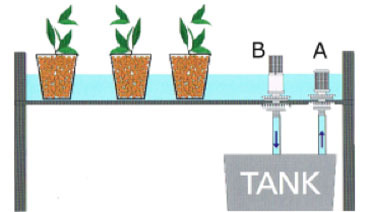 Nutrient Film Technique uses a constant flow of your Growth Technology nutrient solution (therefore no timer is required). 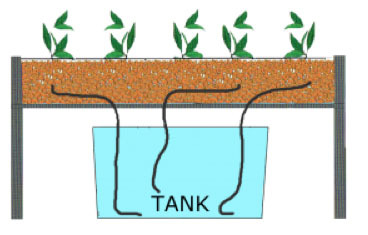 The solution is pumped from a reservoir into the growing tray. The growing tray requires no growing medium. The roots draw up the nutrients from the flowing solution. The downward flow pours back into the reservoir to be recycled again. Pump and electric maintenance is essential to avoid system failures, where roots can dry out rapidly when the flow stops. Aeroponic systems are seen to be a high tech method of hydroponic growing. Like the N.F.T system the growing medium is primarily air. The roots hang in the air and are misted with nutrient solution. The misting of roots is usually done every few minutes. The roots will dry out rapidly if the misting cycles are interrupted.